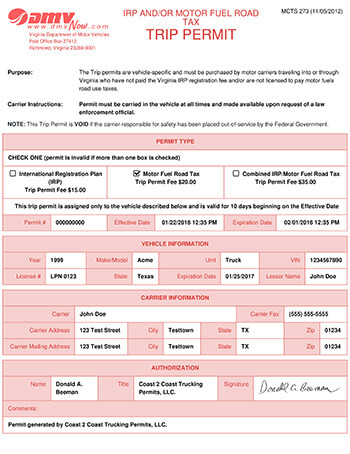 The Virginia DMV offers 10 day trip permits authorizing travel in Virginia for any vehicle that is subject to the International Registration Plan (IRP) or the International Fuel Tax Agreement (IFTA) but is not registered under these programs. $44.95 for Virginia trip permit (plus service fees if you apply through a permit service). $49.95 for Virginia trip permit (plus service fees if you apply through a permit service). $64.95 for combination Virginia IRP and IFTA trip permit (plus service fees if you apply through a permit service). If I have an IRP license plate do I also need to apply for IFTA? are used in combination, when the combined weight is more than 26,000 pounds gross or registered gross vehicle weight at any time. My vehicle weight is less than 26,001 pounds and I deliver to several locations within another jurisdiction, do I need IRP plates? You will be required to get IRP plates or a temporary trip permit for the other jurisdictions if you are doing intrastate movement within another jurisdiction regardless of the weight of your vehicle. Intrastate movement means operation point to point within a jurisdiction. Penalties can range from $100 to $500. Are you planning to do business in, or travel through Virginia? If you have a vehicle registered outside the state of Virginia, regulations state that temporary trip (IFTA) and fuel-use permits must be purchased before you enter the state or else you will be subject to seizure of your vehicle. If seizure of your vehicle occurs your vehicle will not be released until all money is paid to the state. By Virginia state law, both company and vehicle information are required to obtain an instant trip and/or fuel permit.